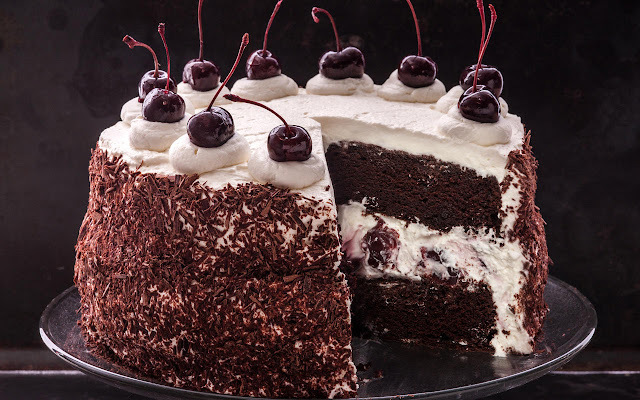 To make eggless black forest cake it takes around 1 hr 30 min. for preparation. Note: you can add eggs if you want egg cake. 1 cup wheat flour, 125 gms. 1/4 melted butter, 60 ml. First, we greased a baking pan of 8 inches x 2 height with oil. heat your oven to 190 degree celsius. Sieve 4 tbsp cocoa powder, salt as you required, 1 1/4 wheat flour, 1/2 tbsp baking soda in the flat bowl. In another bowl, place 3/4 cup cold water and mix it till sugar dissolves. After that add 1/4 cup melted butter in it, mix it well. After that add 1 tbsp lime juice and mix it again. Now, add 1/2 tbsp vanilla powder. Add sieved dry ingredients to the wet mixture again mix it well. Pour the cake in prepared cake pan. Bake the cake in the preheated oven at 190 degree celsius for 40-45 mins. keep checking then bake it at 178 degrees for 20 mins, and again bake the cake at 175 degrees for 35-40 mins. For checking, doneness inserts a toothpick and come out if it’s clean your cake is good if toothpick is sticky bake it again for minutes. 9-10 cherry syrup or 1 tbsp sugar dissolved in 3-4 tbsp water, if you want then you can use wine. First slice the cake carefully with a big knife into two. And in a stand mixer take cream and icing sugar, remember that before use chilled cream it in the refrigerator at least one day before you use it. Now at a high speed run the whip blade, and wipe till the cream become stiff, for 10 min, when you get the stiff peak, just stop the mixer. After that add some sugar syrup on the cake, dissolve 2 tbsp sugar with 4-5 tbsp water or wine if you want. Now spread 1/4 wiped cream. Moist the cake, crumbs will be seen while spreading the cream. Add some layer of chopped red cherries. Then sprinkle grated chocolate on top, cover it with. The top half of the cake. If you have cake decorating stand then use it for better design, decorate the cake with the piping bag. 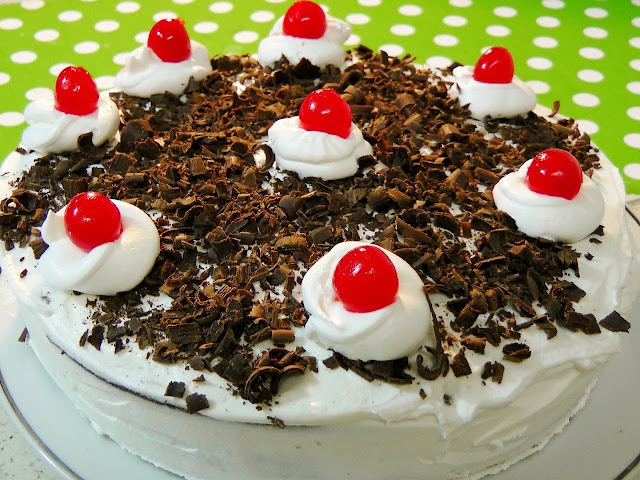 Then add all cherries on the cake with large bowl without touching the cake, cool it down in the refrigerator.